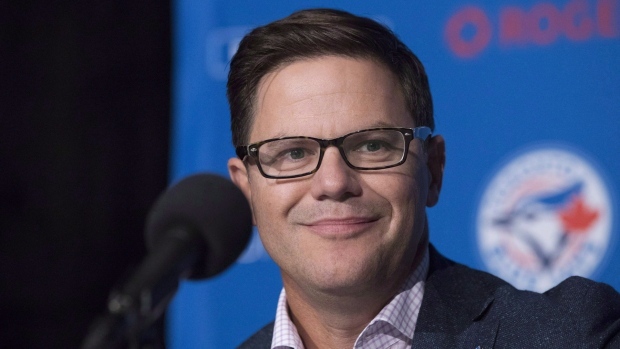 TORONTO - The off-season to-do list for Blue Jays general manager Ross Atkins has a couple of glaring needs at the top as he prepares to head out to Las Vegas for next week's baseball winter meetings. Pitching and defence are two areas that Atkins would like to shore up as he plans for a 2019 regular season that could see a lot of young players get an opportunity. The organization is well-stocked in the minor leagues but it's unclear when that depth will bear fruit at the big-league level. A surplus of middle infielders throughout the team's system could give Atkins some trade bait, or he could go the free-agent route to give his starting rotation a needed boost. At the moment, new skipper Charlie Montoyo has Aaron Sanchez and Marcus Stroman as the key cogs in a rotation that could see Ryan Borucki slotted in at the No. 3 spot. “Young controllable pitching is very difficult to acquire,” Atkins said at a luncheon with members of the Toronto chapter of the Baseball Writers' Association of America. “So we're not going to easily and readily acquire more Borucki or Sean Reid-Foley types. The Blue Jays are coming off another down year in the American League East. Toronto settled for a fourth-place finish in the division with a 73-89 record. More pain is expected for at least a year or two. The good news for Blue Jays fans is that the organization's top prospects could soon be ready for big-league action, with third baseman Vladimir Guerrero Jr., at the top of the list. Guerrero is expected to start the year with triple-A Buffalo before getting a callup a few weeks later, which would give the Blue Jays one more year of contract control. Atkins was asked Wednesday who he expected his starting third baseman to be on opening day. Another big question mark is at shortstop. Lourdes Gurriel Jr., and Richard Urena are in the mix and Troy Tulowitzki appears close to a return after heel surgery wiped out his season. Atkins said Tulowitzki, who has been working out with college players, is recovering well but it's too early to say when he'll be ready for big-league play. The winter meetings are set for Dec. 10-13 at the Mandalay Bay Resort and Casino Resort. The BBWAA chapter also announced its annual award winners Wednesday. First baseman Justin Smoak was a unanimous pick as player of the year and left-hander J.A. Happ was named pitcher of the year. Catcher Luke Maile took the most improved player nod and Borucki was named rookie of the year. Former manager John Gibbons was the winner of the John Cerutti Award for goodwill, co-operation and character.